An Introduction to Nonlinear Analysis: Theory is an overview of some basic, important aspects of Nonlinear Analysis, with an emphasis on those not included in the classical treatment of the field. Today Nonlinear Analysis is a very prolific part of modern mathematical analysis, with fascinating theory and many different applications ranging from mathematical physics and engineering to social sciences and economics. Topics covered in this book include the necessary background material from topology, measure theory and functional analysis (Banach space theory). The text also deals with multivalued analysis and basic features of nonsmooth analysis, providing a solid background for the more applications-oriented material of the book An Introduction to Nonlinear Analysis: Applications by the same authors. The book is self-contained and accessible to the newcomer, complete with numerous examples, exercises and solutions. It is a valuable tool, not only for specialists in the field interested in technical details, but also for scientists entering Nonlinear Analysis in search of promising directions for research. "At last! 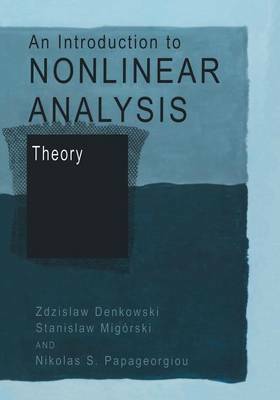 A teachable book on Nonlinear Analysis. Written with the teacher and the student in mind, this book will certainly acquire an important position in everybody's Nonlinear Analysis library."